When the weather conditions are unfavorable, the best option when it comes to driving is to not drive at all. Read this blog post for six tips on how to protect your vehicle from winter potholes. AAA suggests making sure tires have enough tread and are properly inflated. To check the tread depth, insert a quarter into the tread groove with Washington's head upside down. The tread should cover part of Washington's head. If it doesn't, it's time to start shopping for new tires. When checking tire pressures, refer to the owner's manual to ensure they are inflated to the manufacturer's recommended levels. Keep an eye out for potholes when driving. Stay focused on the road ahead and don't get distracted. If you need to swerve to avoid a pothole, make sure to check surrounding traffic to avoid causing a collision or endangering nearby pedestrians or cyclists. If a pothole cannot be avoided, reduce speed, and check the rearview mirror before any abrupt braking, says AAA. Hitting a pothole at higher speeds increases the likelihood of damage to tires, wheels and suspension components. A puddle of water can disguise a deep pothole. Use care when driving through puddles and treat them as though they may be hiding potholes. 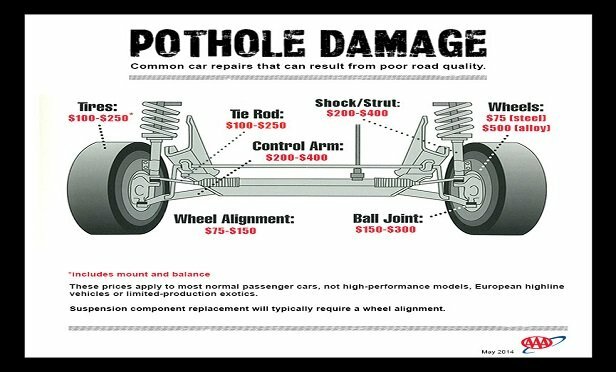 Hitting a pothole can knock a vehicle's wheels out of alignment and affect the steering, says AAA. If a vehicle pulls to the left or right, have the wheel alignment checked by a qualified technician. Any new or unusual noises or vibrations that appear after hitting a pothole should be inspected immediately by a certified technician. A hard pothole impact can dislodge wheel weights, damage a tire or wheel, and bend or even break suspension components, says AAA. 1. Provide security training—Employees are your first line of defense when it comes to cyber threats. Even the most robust and expensive data protection solutions can be compromised should an employee click a malicious link or download fraudulent software. As such, it’s critical for organizations to thoroughly train personnel on common cyber threats and how to respond. Employees should understand the dangers of visiting harmful websites, leaving their devices unattended and oversharing personal information on social media. Your employees should also know your cyber security policies and know how to report suspicious activity. 2. Install strong anti-virus software and keep it updated—Outside of training your employees on the dangers of poor cyber security practices, strong anti-virus software is one of the best ways to protect your data. Organizations should conduct thorough research to choose software that’s best for their needs. Once installed, anti-virus programs should be kept up to date. 3. Instill safe web browsing practices—Deceptive and malicious websites can easily infect your network, often leading to more serious cyber attacks. To protect your organization, employees should be trained on proper web usage and instructed to only interact with secured websites. For further protection, companies should consider blocking known threats and potentially malicious webpages outright. 4. Create strong password policies—Ongoing password management can help prevent unauthorized attackers from compromising your organization’s password-protected information. Effective password management protects the integrity, availability and confidentiality of an organization’s passwords. Above all, you’ll want to create a password policy that specifies all of the organization’s requirements related to password management. This policy should require employees to change their password on a regular basis, avoid using the same password for multiple accounts and use special characters in their password. 5. Use multi-factor authentication—While complex passwords can help deter cyber criminals, they can still be cracked. To further prevent cyber criminals from gaining access to employee accounts, multi-factor authentication is key. Multi-factor authentication adds a layer of security that allows companies to protect against compromised credentials. Through this method, users must confirm their identity by providing extra information (e.g., a phone number, unique security code) when attempting to access corporate applications, networks and servers. 6. Get vulnerability assessments—The best way to evaluate your company’s data exposures is through a vulnerability assessment. Using a system of simulated attacks and stress tests, vulnerability assessments can help you uncover entry points into your system. Following these tests, security experts compile their findings and provide recommendations for improving network and data safety. 7. Patch systems regularly and keep them updated—A common way cyber criminals gain entry into your system is by exploiting software vulnerabilities. To prevent this, it’s critical that you update applications, operating systems, security software and firmware on a regular basis. 8. Back up your data—In the event that your system is compromised, it’s important to keep backup files. Failing to do so can result in the loss of critical business or proprietary data. 9. Understand phishing threats and how to respond—In broad terms, phishing is a method cyber criminals use to gather personal information. In these scams, phishers send an email or direct users to fraudulent websites, asking victims to provide sensitive information. These emails and websites are designed to look legitimate and trick individuals into providing credit card numbers, account numbers, passwords, usernames or other sensitive information. Phishing is becoming more sophisticated by the day, and it’s more important than ever to understand the different types of attacks, how to identify them and preventive measures you can implement to keep your organization safe. As such, it’s critical to train employees on common phishing scams and other cyber security concerns. Provide real-world examples during training to help them better understand what to look for. 10. Create an incident response plan—Most organizations have some form of data protection in place. While these protections are critical for minimizing the damages caused by a breach, they don’t provide clear action steps following an attack. That’s where cyber incident response plans can help. While cyber security programs help secure an organization’s digital assets, cyber incident response plans provide clear steps for companies to follow when a cyber event occurs. Response plans allow organizations to notify impacted customers and partners quickly and efficiently, limiting financial and reputational damages. Cyber security threats and trends can change year over year as technology continues to advance at alarming speeds. The occupational group with the highest rate of male suicide is construction and extraction, according to a recent report by the Centers for Disease Control and Prevention (CDC). The report was based on data from 17 states and the National Violent Death Reporting System’s totals from 2012 and 2015. It found that the rate of suicide in the construction and extraction group was 53.2 per 100,000 workers in 2015, significantly higher than the suicide rate for all American workers, which was 17.3. Foster social connections and economic supports. Improve access to appropriate mental health resources, and encourage at-risk individuals to seek mental health treatment without judgment. For more information, visit the Construction Industry Alliance for Suicide Prevention website, which provides information about mental health services and other resources. Because of the shortage of skilled construction labor, close to half of all construction job postings take over six weeks to fill in California, making it the third-longest wait in the country. As a result, contractors from other states may be joining the rebuilding efforts after the recent wildfires. Before securing construction projects in California, keep these considerations in mind. Insurance could affect how you get paid. Most people affected by the wildfires should be covered by insurance, but it isn’t likely to cover the entire cost of rebuilding. And when insurance companies make progress payments for work done, they may subtract the owner’s deductible from your payment. Discuss this with the owner, and make payment arrangements ahead of time. You need a 20-day preliminary notice. If you’re doing construction or demolition work in California, you should send a 20-day preliminary notice to all property owners and general contractors you’re doing work for. This gives you the right to file a valid mechanics lien in the event of nonpayment. California has strict licensing requirements. If you do contracting in California, there is a good chance you’ll be denied payment without a proper license. And if you are paid, you may even be required to pay it back if the state discovers you did unlicensed work, especially if you’re relying on getting paid from your client’s insurance company. Most importantly, make sure you’re licensed and fully insured before considering taking on rebuilding efforts in California, or in any state. Employee exposure to unguarded machinery causes over 18,000 amputations, abrasions, lacerations and crushing injuries every year. Despite ’s efforts to protect you from those hazards, some may not have been anticipated and guarded. Even a small change in a machine’s usage can expose you and those around you to new risks. Know how to report hazards. Inform as soon as you identify unguarded machinery so it can be properly addressed. Make sure you can safely get to and from any area that requires you to work from a height. Wear personal protective equipment and personal fall arrest equipment as required for the job. Make sure your ladder and any other equipment needed is strong enough for the job and checked regularly. Know what to do in case of an emergency or need to evacuate so you can do so safely. Don’t overload your ladder. Check the label on the ladder to make sure it is capable of supporting both you and your equipment before using it. When on a ladder, don’t overreach. Never rest a ladder against unstable or weak surfaces. Don’t use ladders to increase the working height of a scaffold. If you notice anything that could pose as a potential workplace hazard, please report it to your manager immediately so it can be addressed promptly. 25 percent of falls are from a height of less than 15 feet. Over 800 deaths per year are caused by worker exposure to unguarded machinery.